In physics, escape velocity refers to the speed necessary to break free of gravitational field without further propulsion. For example, to leave the earth’s gravitational pull requires approximately 40,320 km/h, or 25,000 mph. This was first achieved in 1959 by Luna I. Very interesting, but what does escape velocity mean in relation economics? In essence, escape velocity is a fancy way of saying a sustained economic recovery. But, the phrase nicely creates an image of how in certain circumstances, an economy can be held back by certain downward pressures. If the economy reaches an escape velocity, then we see a virtuous circle of rising GDP, rising tax revenues, rising confidence and rising investment. When this escape velocity is reached, we no longer need to support the economy with expansionary fiscal policy and expansionary monetary policy. Growth should be self-sustaining by normal private sector activity. What prevents the economy reaching escape velocity? Low confidence. When the economy is stagnating we see low business and consumer confidence. This leads to a fall in spending and investment. For example, the UK has seen a sharp rise in savings as the private sector are reluctant to spend and invest. Negative multiplier effect. During an economic stagnation, firms produce less and we will see low wage growth and high unemployment. However this low wage growth and high unemployment leads to lower spending, which in turn contributes to higher unemployment and lower wage growth. Deflationary debt spiral. In a recession, budget deficits increase because of automatic fiscal stabilisers. In response, the government may seek to reduce the budget deficit, through limiting spending. However, the pursuit of austerity measures can lead to lower growth, and therefore governments miss their deficit reduction targets. In response, governments further tighten fiscal policy, leading to prolonged low growth. Bank losses. In a balance sheet recession banks have to deal with many loan defaults. These bank losses mean they want to improve their reserve ratios. This makes banks reluctant to lend, and therefore firms and consumers struggle to find their usual access to finance. This holds back economic growth. Global financial instability. Global financial instability will harm bank lending and reduce confidence. Global recession. A recession in your main trading partner will make it difficult to increase exports. Real wage unemployment. New Keynesians may stress micro-economic factors, such as sticky wages. If wages don’t fall to a new equilibrium, workers price themselves out of the labour market leading to prolonged unemployment. Economists will take different views on stagnant economies. The Austrian / Classical view will say that the only thing holding back normal economic activity will be interference from the government / Central Banks, e.g artificial manipulation of interest rates holding back normal lending, taxes distorting economic behaviour. The Keynesian view will stress the importance of inadequate aggregate demand keeping the economy at a below equilibrium level. What will escape velocity look like? 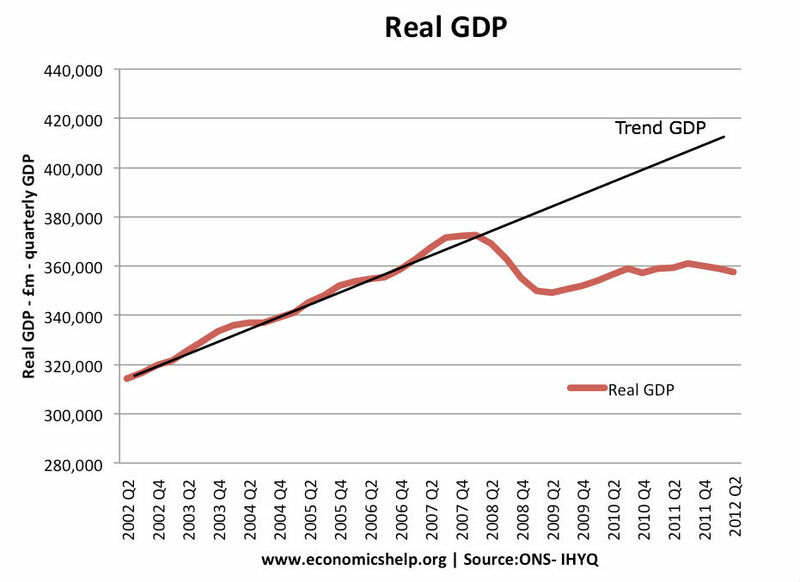 Removal of monetary and fiscal support doesn’t derail the economy. If the economy can absorb rising interest rates and fiscal consolidation without ending economic growth. Conclusion – what is the importance of escape velocity? Escape velocity is useful for creating the idea that in a liquidity trap / deep recession, policy makers need to be bold and target a real escape velocity. For example, if policy makers are timid in pursuing economic recovery (e.g. pursue deflationary fiscal policy when private sector demand is weak, this can easily keep the economy in a negative spiral of low growth, low confidence and high unemployment. The quicker the economy reaches escape velocity – the quicker the government can end fiscal stimulus, and the quicker the Central Bank can return interest rates to normal interest rates.